Yes! 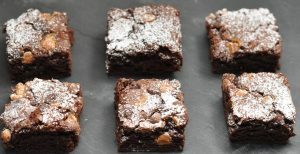 You can now order my gorgeous, gooey, gluton free chocolate brownies delivered straight to your door. Maybe it’s someone’s birthday and you’d like to send them a special treat. Or maybe a ‘thank you’ box for someone to receive at their work place. Or a sneaky treat for yourself. All boxes are sent recorded first class signed for Royal Mail delivery. Uk mainland only. A added cost of £2.85 per box will be charged for delivery. You are always welcome to collect your order.